This solar active region was observed by TRACE at 03:30UT on 12 April 2000, in the 171Å passband, characteristic of 1-million degree gas. The TRACE (Transition Region and Coronal Explorer) is a NASA Small Explorer mission to image the solar corona and transition region at high angular and temporal resolution. alt="Your browser understands the <APPLET> tag! but isn't running the applet, for some reason" Your browser ignoring the <APPLET> tag! 4th control point at the other foot point of the loop. The Bezier spline curves are used in computer graphics to approximate curves. The curves are manipulated by control points as the example above illustrates. Also we have a simple movie of the process of changing a control point which changes the shape of the curve For a introduction to Bezier spline curves and their extension to NURBS (non-uniform rational B-splines) see the book The NURBS Book (by Les Piegle an Wayne Tiller, Springer, 1995). The extension of these methods into 3D have led to a new area of solar research. 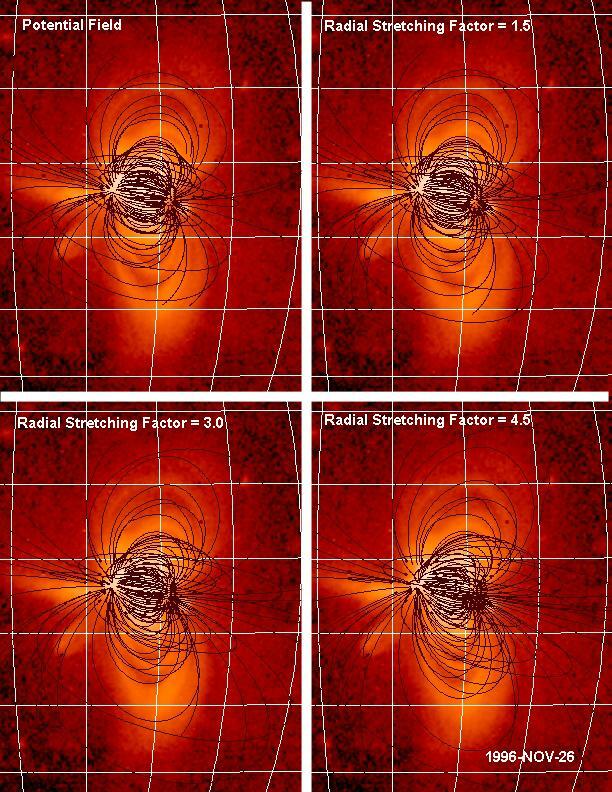 It was discovered by Allen Gary and David Alexander (Solar Physics, 1999, 186, 123) that radial stretching potential field lines produced a better fit with the observed coronal x-ray loops. A generalization of radial stretch can be accomplished by imposing a four-dimensional polynomial Bezier volume and using their control points to distort a volume which distorts the field lines. An example the volume distortion shows changes in a circular loop to an elliptical loop when the upper surfaces of the volumes are radially stretched by changing one control point. 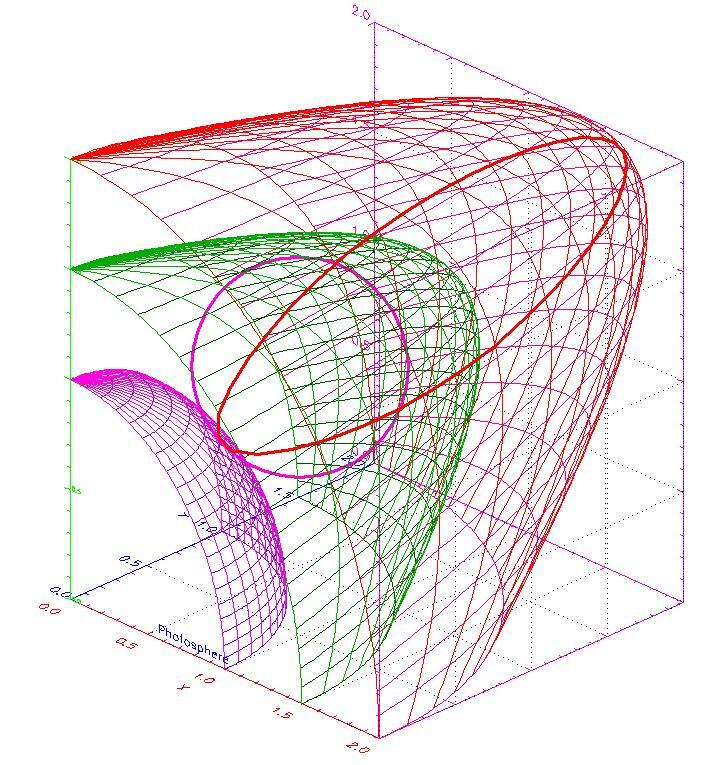 This is a 3D extension of the method above which creates planar curves. This new research program into the complex magnetic field topology of coronal features is now being investigated by Allen Gary using Parametric Transformation Analysis (PTA). PTA is a new and innovative method to describe the coronal fields. PTA uses a magnetic field transformation that parametrically transforms a field (and the associated field lines) to match the coronal features. In this technique the field lines can be viewed as being embedded in a plastic medium, the frozen-in-field-line concept. As the medium is deformed the field lines are similarly deformed. However the advantage of the PTA method is that the field line movement represents a transformation (or mapping) of one magnetic field solution into another magnetic field solution. This method allows the resulting magnetic field solution to fully match the magnetic field lines with EUV/SXR coronal loops by minimizing the differences in direction and dispersion of a collection of PTA magnetic field lines and observed field lines (i.e., the centroids of the coronal loops). From the new description of the magnetic field, the coronal electric currents and magnetodynamic forces can be derived allowing the details structure of the solar corona to be investigated. The Java program is an adaptation of a program by Mike Heinricks.